Detectives arrest the man accused of secretly staging the fights. ST. LOUIS—Local law enforcement officials announced Monday they had broken up a major giraffe-fighting ring, arresting two alleged organizers and 12 spectators found at the scene, in addition to confiscating $45,000 in cash and 10 badly abused giraffes. 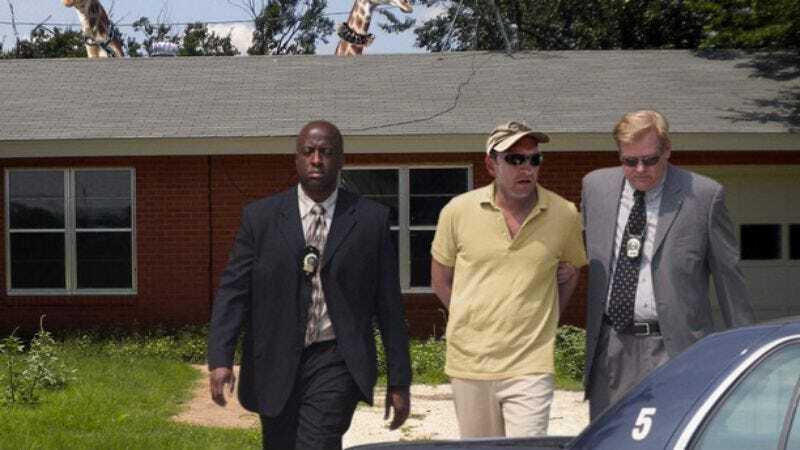 After receiving an anonymous tip from a worker repairing a power line, federal agents and St. Louis police raided the residence of Curtis Phillips, finding two giraffes engaged in a bloodthirsty battle inside a 20-foot-deep pit splattered with feces, urine, and cud. Officers, who described the backyard operation as "horrifying," also reportedly found a dead giraffe stuffed into 16 separate garbage bags. Police carry another victim from the shocking scene. "This might very well be the largest giraffe-fighting ring in North America," police spokesperson Heather Walker said. "We seized a great deal of the usual paraphernalia, including 80 pounds of chains, spiked leather collars, a treadmill, a padded suit, and several pairs of stilts." According to the animal-control task force, handlers forced the giraffes to live in filthy conditions, starved them for days, and trained the creatures to rip out each other's throats—often by beating them from a safe distance with the help of a crane. Arrest records also contain accusations of razor blades being attached to the giraffes' horns to increase damage during fights. The 33-year-old Phillips, currently the main suspect in the case, denied allegations that he staged the cruel contests, claiming that he keeps the 17-foot-tall animals as guard giraffes to protect his home. In perhaps the most disturbing discovery, detectives unearthed a mass grave on an adjacent property containing 32 dead giraffes. "It was one of the most deplorable and utterly sickening things I've every seen," Detective Dean Wagner said. "The paperboy was the first one to stumble across it when he noticed a number of decaying heads sticking out of the ground." According to the American Society for the Prevention of Cruelty to Animals, the rescued giraffes are currently staying at shelters, and with many of the giraffes remaining highly combative, officials are concerned it may be difficult to find homes for them. "These fighting rings give giraffes a bad reputation as violent animals, even though they're actually very gentle creatures," ASPCA president Edward Sayres said. "Trainers get them when they're babies and only 6-feet-tall and then force them to fight. In nature, they seldom nibble each other to death like that." "At present, there are only a few known incidents in which an abused giraffe has killed a child," Sayres added. "And in each of those cases, the child was left unattended near an open second-story window." Sayres said that since the late 1980s, giraffes have become a status symbol in many American cities, but increasingly, the grazing land mammals are dropped off at shelters when they become too difficult to care for, usually because their owners live in small apartments or homes without high vaulted ceilings. Neighbors of Curtis Phillips expressed surprise upon learning an illegal giraffe-fighting ring was located only six blocks away from the elementary school his children attend. "I always knew that Curtis had giraffes, because I'd see their heads popping up above the roof of his house," neighbor Ryan Erck said. "But I never knew he was breeding fighter giraffes. It does explain all the late night grunting and stamping noises coming from his place." "Still I can't believe he was making so much money tormenting and exploiting giraffes," Erck added. "You'd think with that much cash rolling in he wouldn't be living in a one-story duplex."